In the summer of 2011, the man who wrote the classic Hollies song Bus Stop, finally got himself a bus pass of his own as Graham Gouldman reached the age of 65. It’s well documented how the Beatles conquered America in 1964, but from some of the articles you read you’d think that the Beatles were the only British group to have major success at the time, but not so. The two biggest British groups who gave them a run for their money were both The Hollies and The Dave Clark 5 who had 27 hit singles each. The difference between them was that the Dave Clark 5 wrote the majority of their early hits and the Hollies did covers, especially in the early days. 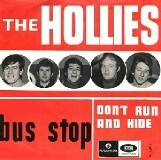 The song that gave The Hollies their first American top 10 hit was indeed Bus Stop and was written by the budding songwriter Graham Gouldman. Graham was born in 1946 in Salford, Manchester, although when he was born it was under Lancashire, to a Jewish family and throughout 1963 and part of 1964 he had been a member of a myriad bands including The High Spots, The Planets and then the Whirlwinds. In early 1965 he formed another band which were called The Mockingbirds and featured Kevin Godley. The first Gouldman-penned song they recorded was called For Your Love. They’d signed a deal with Columbia records but the label didn’t like the song. It was then recorded by the Yardbirds and got them a number three hit. Their follow-up, Heart Full of Soul was also written by Gouldman and went one better by peaking at number two. He offered a song to the Hollies called Look Through Any Window which made number four. The next song he wrote was called Bus Stop. Was it a real bus or stop that inspired the song? Graham explained, “I began writing it whilst riding on the No. 95 bus which ran from East Didsbury – the route went through Manchester city centre, to Sedgeley Park, Cheetham Hill, Prestwich, and on to Whitefield near Bury. We were supporting the Hollies at Stoke Town Hall, they’d already done Look Through Any Window, and they asked me if I had any songs. So I borrowed Tony Hicks’ guitar and went into the toilet with him and Graham Nash – this doesn’t sound very good does it?! – I played it and they said it was great. They recorded the following week and it was out three weeks later. There were no videos in those days to delay everything. In 1971 Gouldman, Godley and two new members, Lol Creme and Eric Stewart together formed 10cc, a name dreamed up by their then-manager Jonathan King, and bought their own studio which they called Strawberry. Initially there were a backing band for artists like Wayne Fontana, Herman’s Hermits and Neil Sedaka and then had a successful career notching up a dozen hits including three number one all having lead vocals by a different member of the band and Gouldman co-writing all three of them. In 1976 Godley and Creme left to continue as a duo and in-turn leaving Gouldman and Stewart as the 10cc duo. 10cc officially split in 1983 but have had sporadic reunions with varying members. In the winter of 2013 they went out on tour supporting Status Quo and the following year Graham was inducted into the Songwriters Hall of Fame at the 45th annual ceremony in New York.